We know this looks like a lot of our other LEDs, but it's not! This is a PTH Addressable RGB LED with a WS2812 (or "NeoPixel") control IC built right into the LED. This PTH version is incredibly similar to its SMD cousin, except it is a lot simpler to solder into your project and is in a diffused 8mm package. This RGB LED has the control IC moved into the actual LED, so we wanted to offer this amazing product to you! They’re great when you need a lot of color from not a lot of board space, now more so than ever. Mine are a bit buggy when doing an RGB cycle anyone know how to remedy this? Does anyone know how bright these are? It would be good enough to know how much current they draw. Sorry to be dense, but is it necessary to continuously update the LEDs, even if the colors are all static? In my app, very little change of colors will be taking place, and the uP has plenty of other things to do other than shifting all those bits. If it can be left alone after update, I guess the level would be left high, then a reset issued before starting again later? Thanks all. Does anyone have any info as to how quickly you can change these with an arduino? That's not a datasheet, it's a marketing brochure. Where can I find the real datasheet for this device? How bright do they go? How much current do they draw? The Data out pin on these devices drives neopixels well. I am not sure why not but the data out from neopixels will not drive this during my experiments so far. I'm not sure why. The long pin is ground. Don't reverse 5v and ground, not surprisingly these will not work properly after that. You can reverse conventional LED's, not these. I also noticed the power on blue effect someone else mentioned. Seems it would be easily enough to build a wrapper function -- or just modify the original library -- to transpose the RGB/GRB values. Mine immediately illuminate blue when powered. How do i stop this? i don't want my project to suddenly flash bright blue every time it power cycles. did i get a bad batch? They do that by design. Write 0's to them. I am able to make these work with several different devices, uno and trinket, but I am trying to get them to work with a stand alone ATtiny85, has anyone had any luck making this work? I am using the Adafruit_Neopixel. does anybody know who is manufacturing these? i'm looking for thousands of units. thx for any info. I find it rather ironic that they were in stock on Friday when I first discovered them here. And they are now out of stock. What is the pin spacing? 0.1" ? No, they are not .1" spaced pins. You'll have to be creative with the pins if you need to mount them flush to a breadboard. Otherwise they work much like the way three pins parts like https://www.sparkfun.com/products/522 do. What is the maximum brightness of the Led per primary color? I did not see that spec in the one-page datasheet. 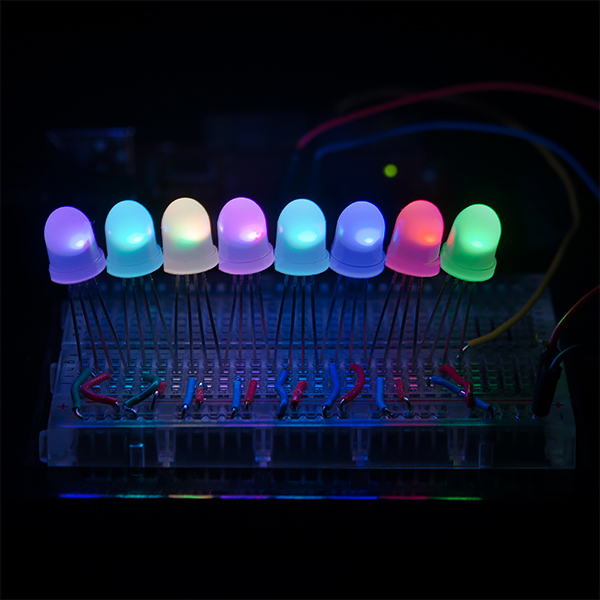 Just curious if anyone has a link to some arduino code to control these LEDs in a 5 x 5 grid. I guess I would like to know how to send the id for each LED. Or if you were using only 5 of them how would you address them in Arduino code? You use an Arduino Library (e.g., Adafruit's Neopixel library), which allows you to call functions such as myLEDArray.setPixel( index, RedValue, GreenValue, BlueValue ) to address each LED according to its index. That's the gist of it, but yep, read up a bit on the so-called Neopixels to understand the communication protocol. Nick, from taking a look at the datasheet, it looks to me like you don't need set any ID in each LED. I'm not sure I would use the term 'addressable' to describe these (because I initially had the same question as you), but they are daisy-chained. You need to serialize your data for each of the LEDs and send it all to the first LED which passes the data for the remaining LEDs to the next one, and so on. Brightness? About the same as WS2812? Is all you really need and should be linked from this page. What size are these? The datasheet lists an 8mm and a 5mm. "This PTH version is incredibly similar to its SMD cousin, except it is a lot simpler to solder into your project and is in a diffused 8mm package." The wiring diagram is sufficient, but where are the protocol notes on how to set the colors as you shift through them. There is a real problem with the datasheet. After downloading it, only the first page will display. There is obviously more information on the datasheet than is displayed. @ARTTEC: What are you looking for? I've seen less for ordinary LED devices. The communication protocol for changing colors and brightness is absent. So where's the rest of the data sheet? Not enough info there to use this cool LED! You are right. The datasheet does not even describe how to address the LED's. SparkFun support, please advice. They are physically larger than I expected (not sure which part of 8mm I didn't understand when I bought them - reading is important) but they work great/as advertised/etc. 4/5 work perfectly, one died pretty quickly after sticking it first in a breadboard, then a PCB. It almost lights up if I attach VCC to the lead right below the cap, but dimly andv inconsistently. Less durable than a standard LED, but you get flashy colors.